The Cactus M concept is a modern take on the values that led to the development of the Méhari. Values relating to comfort, well-being and leisure, which have always been part of Citroën. At ease on all types of terrain and in all situations, the Cactus M concept inspires a sense of well-being, freedom and escape. 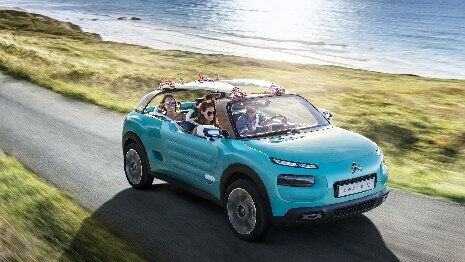 The SUV looks of Cactus M, already suggested by the C4 Cactus, are underlined by its styling and specific features. The strong compact build of Cactus M is underlined by the 60° angle of the windscreen and its bold surround, which conveys a sense of strength. Cactus M has two elongated doors. The design of these one-piece in moulded plastic make them particularly easy to use while also reducing overall vehicle weight. These doors are designed like Airbump®. Open air - no roof! 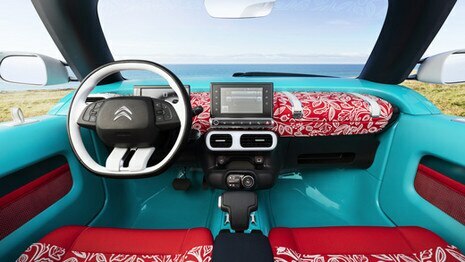 Inspired by the surfing spirit, Cactus M has no roof or front pillars. It is completely open to the outside. The wood panelling over the boot arch and on the windscreen surround brings to mind the way surfboard manufacturers customise their boards. The character and strong personality of the Cactus M concept car is inspired by the 1968 Méhari and the seaside world associated with this legendary model. The beach, sand, salt and water are all considered as incompatible with cars. However, Cactus M was designed for this environment, to let users enjoy an intense, uncompromising leisure experience. 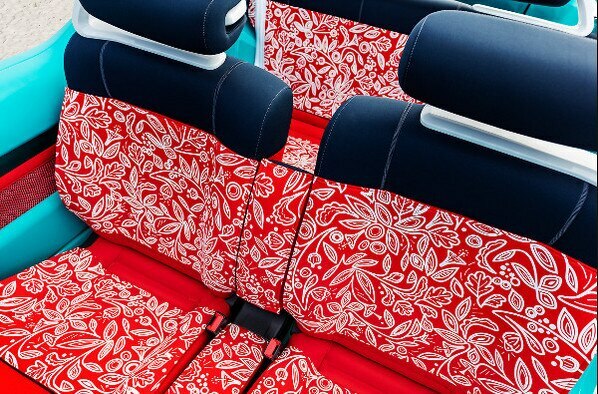 The brightly coloured neoprene fabric adds warmth to the cabin and underlines the vehicle's "alive and vibrant" quality. It also increases the waterproof qualities of the seats and reduces the time required for them to dry. Inside the vehicle, a range of functional storage compartments are available. The front doors have large bins closed by a net. The boot is accessed from the outside. Designed for people who enjoy wide open spaces, Cactus M concept is the ideal partner for an adventure. Whatever the activity, the weather or the road conditions, everything is designed to ensure a relaxing ride for the occupants. Cactus M can be turned into a bivouac for two people, making it possible to extend the outdoor experience. Users can either sleep in the open or under cover, using the inflation function to turn the top into a freestanding tent.. The only item missing is the sunshield!